I am combining a couple of paintings in the one post. All of these 4 x 6 oils were painted from life. 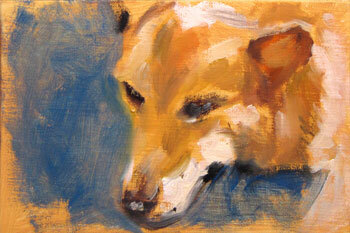 The first painting is of our male corgi, Throop. He came into the studio where I was putting the finishing touches on a painting and decided to sleep. It seems that whenever you are painting a candid subject, (where no is posing but you are capturing what is happening around you) your subject always waits until you are at the decisive point of the painting and then changes position or just leaves. Throop did just that, got up moved to another part of the studio. After I finished painting, he came back and laid down in the original spot and back to sleep. This happens with just about every subject. From people sitting at a cafe table for two hours and then suddenly get up and leave to cows in a field who will all move out of the sunlight to the shade at one time. 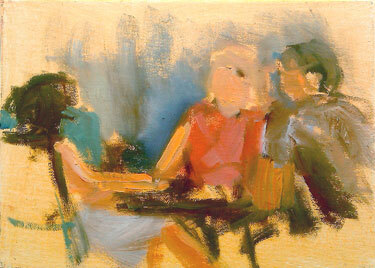 This next painting was started at an outdoor cafe where I had set up and was painting the scenes around me. As mentioned above, this group suddenly got up and left. 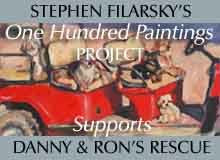 I didn't see where I could go with what I had so the panel was wiped clean for another paintng. The second painting on the panel was of four young women getting together for coffee. 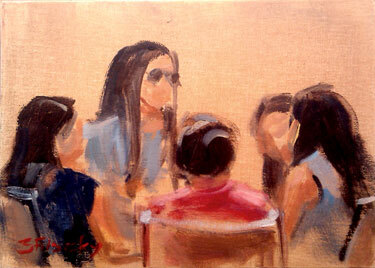 I began painting as soon as they sat down and quickly got the basic shapes. 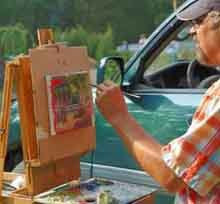 Then the shadows and highlights and this painting was done. They didn't leave but constantly changed positions and yes, the girl with the sunglasses was that tall.